The Corpus Christi Caller-Times each week features a column on South Texas history by Murphy Givens. These articles on people, places and events of years gone by are eagerly awaited each Wednesday. 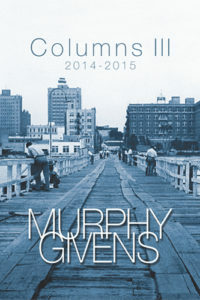 Columns III is the third compilation of such articles, with columns from 2014 and 2015 included in this volume. They tell of adventurers, outlaws, settlers, cowboys, ranchers and pioneers who came to the Coastal Bend of Texas, struggling against nature and their fellow man to make their homes and livelihoods. This collection of 102 newspaper columns includes 164 photographs and maps, source notes and a full index.